The Philips HD4671/20 brushed metal energy efficient kettle is a stylish metal kettle with unique feature: the one-cup indicator. This allows you to avoid boiling more water than you need, saving up to 66% energy compared to a regular kettle, and helping you to reduce your impact on the environment. Hinged locking lid: easy to use, maximum safety. Lid stays cool for optimal safety. Pirouette 360° centre connector for easy lifting and placing. Light indicates when the kettle is switched on. Flat heating element for fast boiling and easy cleaning. Double action filter for clear water and a cleaner kettle. Quick and quiet compared to other kettles on the market. The water gauge instantly shows you the amount of water you can use, by Cup indicators without having to guess. The Opula kettle & Toaster range by Breville is sleek, both kettle and toaster are finished with a fantastic pearlescent tone. The new Opula Collection of kettles and toasters from Breville are stylish, modern and come in a range of high quality pearlescent painted finishes which means that there is bound to be a colour that will complement your kitchen. The English tried and tested constitutional 'the cuppa' has so many shades of tea and coffee to go please everyone. So what you expect inside your mug is one thing... but when it comes to your kettle, colour can now be vivid and vibrant. 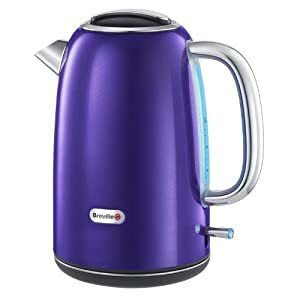 Breville Opula Stainless Steel Jug Kettles stylish and have the essential features and functions required in today’s busy lifestyle. 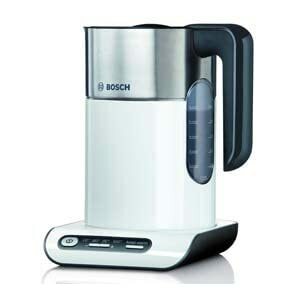 With internal illumination on boil, easy-view rear water window for accurate filling and a generous family size capacity of 1.7 Litres - these kettles come with the features to match the unique pearlescent finish. 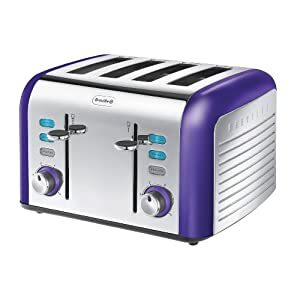 The Breville Opula 4 Slice Toasters has a pair of independent, variable width bread slots, which are perfect for all different sizes of bread, whilst the variable browning control will mean that your toast is exactly how you like it. The toaster also features Breville's innovative Lift and Look function. This function helps you to check on the progress of your toast without disrupting or cancelling the cycle. Thanks to the extra high lift mechanism, taking your toast out couldn’t be easier. Other functions include reheat, defrost, and mid-cycle cancel functions and comes equipped with twin crumb trays for easy cleaning.